We are often asked how the “Hop Substitution Charts” available on the web came about. There is some variation among them, but many appear to be carbon copies of each other. What are they based on? Hop chemistry? Parentage? Sensory Panels? Educated guesswork? Test brews? Marketing sleight of hand? I asked my friends at OSU and the consensus was anywhere between “pseudo-science” to all of the above. If anyone has any insights on the basis (or reliability) of the hop substitution charts (e.g., see http://www.byo.com/resources/hops) please let me know. We aren’t so bold as to assert that one hop can be “substituted” for another – at least not without accurate genetic and sensory information. We prefer to say that one might present a suitable “alternative” for another. When the hop “shortage” struck in 2008, many brewers scrambled to find substitutes for aroma hops. Many brewers tapped higher alpha varieties and to this day have stuck with them. One macro-consequence of this recipe change has been a decrease in the production and usage of aroma hops compared to pre–shortage years. The recent New Brewer reported substantial decreases in the US acreage of workhorses such as Cascade and Willamette, while acreage in the “dual purpose” powerhouse Centennial has actually increased since 2008. Based on anecdotal encounters with brewers, I’ve noted a trend towards simplification of the aroma hops used. It appears that while usage of public varieties, such as Sterling, Cascade and Mt. Hood has fallen, proprietary cultivars, such as Amarillo, Palisade and dual purpose Simcoe has gone up. Of course, when a hop is proprietary, the owner can limit which farmers can grow it. The owner stands to obtain a licensing fee or royalty from the sale of the hop from the grower to the owner/merchant. Since many of the hop merchants in Yakima also own patents on hop cultivars (e.g., Simcoe, Palisade, Citra, Amarillo, Warrior), it’s no secret that between public and their own varieties they’d rather push their own. That’s simply an illustration of the guiding hand of self-interest in a capitalist, laissez-faire economy. But when each Yakima hop merchant pursues their own self-interest, is it true that Adam Smith’s “invisible hand” magically makes sure that hop varieties are fairly and propitiously allocated in a way that insures the march of the craft revolution? Is the trend towards less diversity of the hop supply good for crafties? Is the consolidation of hop acreage in Yakima good for crafties? Should crafties rely on foreign imports when suitable varieties can be grown less expensively and more reliably in the US? Do crafties benefit when each year we see fewer heritage hop farmers willing to give it another go? Is the risk of over dependence on a narrow menu of varieties acceptable? These are big questions. I’m sure the patent owners can make a strong argument that their hop inventions are unique and superior. There’s absolutely nothing wrong with owning patents. It takes years of R & D to bring home a winning cultivar – such as Citra. The question that intrigues us is not whether a proprietary hop is unique, but how unique is it? That’s where the “substitution” charts come in. Within the framework of the aroma hops breeding program we sponsor at OSU, we will be looking at the design of a “sub” chart that is based on science and sensory analysis. In the meantime, when brewers ask us for an “alternative” to Simcoe, we suggest Chinook, based mainly on the grapefruity aroma and the similar alpha acid profile (Centennial’s another choice). We’re not absolutely sure on parentage of Simcoe, since it’s proprietary. 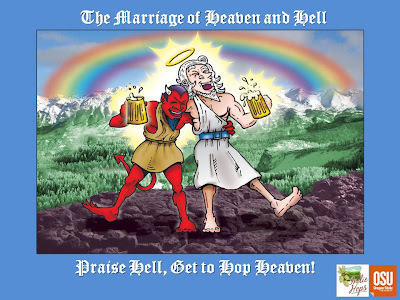 It may be best to suggest blends of hop varieties to attain a particular character. As an example, it might be useful to say, “instead of Simcoe, use 50% of Hop A, 25% of Hop B, and 25% of Hop C.” Of course, as OSU continues to develop crosses in the pursuit of unique aroma hops, perhaps the day will come soon when the choice will be simple. As we explore these questions, we’re always learning more from you about what works. Have you on a lark or hunch swapped out one variety (or blend of varieties) to imitate or, better yet, emulate a go-to hop? How did it go? We’d love to hear about your fortuitous trials and even your not so happy errors. Riding the Wave at Karl Strauss with Chris Cramer and Paul Segura or, What’s He Building In There? SAN DIEGO, CA. A few years ago I bellied up to the bar at a swanky wedding reception at a glass and steel museum in downtown Portland. My hard-nosed buddy Jim Solberg had just tied the knot with the lovely Anca , ending years of speculation that Jim was destined to spin out his days puttering in his hermit-ically sealed woodshop. The crowd was up – this was our Super Bowl. Amidst the rockets bursting in air, we were tensely awaiting the opening kick-off, coiled to spring headlong into what man or beast got in our pay. In short, we were ready to party, and party hard. Next to me at the bar was a double-kegger of a man dressed comfortably in a body that seemed carved out of a towering platter of German pilsner soaked brats. I’d heard him speak at the wedding and knew he could handle an audience, and his alcohol. Charming, full-throated, appropriately reverent -- your standard-issue Stanford brainiac with the beer belly to match. He had just delivered a rousing toast tinged with humor and affection, and his mouth was dry. Pustules of dried spittle had gathered at the edges and I feared those enormous lips locked in a knowing grin would soon crack. I’d heard that this patron of jolliness was in the beer business. I deduced from the Zen like way in which he carried himself that he knew things – important things-- the rest of us didn’t, so I waited for him to place his order. “I’ll have the Karl Strauss Amber Lager,” he casually beckoned, as if any other choice would have been uncivilized. It struck me, the way the four-letters (Karl *Strauss*Amber*Lager) rolled off his tongue as if it were one incantation, and the recital of same itself was an expression of piety . He was, by any account, the quintessential proud Papa, serenely privileged to share his pride and joy with the rest of us. I had known of Karl Strauss. I’d tasted their beer and had bought a few cases in my time. Smooth, drinkable, festively carbonated. But I’d never held it up as the Golden Doubloon of fermented malted beverages. Now, standing their awe-struck next to this adoring tippler, my interest had been piqued. What does he know that we don’t? What’s he hiding in there? More critically, how could I tap into it? He exuded a confidence that hinted at owning a secret recipe for untapped greatness and limitless wealth. The man’s name? Chris Cramer. Co-owner of Karl Strauss Brewing and classmate of Jim Solberg’s down at the Farm. A true believer. At the time, Karl Strauss was offering about 3 bottled beers, generally aimed at the growing legions of industrial lager drinkers who were just dissatisfied enough to be curious about dabbling in craft. What Chris Cramer knew that we didn’t was that Karl Strauss was busting to break out. They’d invested in a brew house and were primed to up their game, expand their repertoire, and experiment like crazy with heavily hopped brews, despite the edict of Uncle Karl who decreed in his day that Americans would never take to a beer whose bitterness crossed the 45 IBU Rubicon. Today, the new and hopped-up Karl Strauss proudly offers 14 bottled beers and over 22 styles, plus a bevy of oddball but ambitious seasonal and drafts. They use over 25 varieties of hops. The other night I cracked a 22 oz bottle of a Belgian ale that had been aged in a bourbon cask. A few months earlier, Cramer had presented the bottle to me solemnly, as it were a rare loaded gun. Normally ,I enjoy sharing new grogs with my Lovely, but not this beauty. Within a few sips, my mind had begun to secrete from my body. A pint later, I was floating inside a cave pub in Salzburg, my back up against the ceiling, splayed out like a starfish, smiling down on all the wonderful good times seekers below. Easily the most deliriously delicious brew that had ever touched my soul. We know today that Karl Strauss has arrived, thanks in large part to the workmanlike execution of Chris Cramer’s carefully crafted vision by brewmaster Paul Segura. Segura, who joined KS in 2001, is unafraid. Built like a butterflier with the wingspan of a California condor, the towering brewer never met a beer style that stared him down or left him weak. Belgians, pales, imperial pils, imperial IPAs, Black IPAs, hefeweizens, whateveryougot – bring it on. Seasonals and draughts galore. KS recently brewed up a Rye IPA for their pubs using generous amounts of our Cascade hop pellets. The verdict, per Paul: “Everybody loved it!” KS, to the delight of this proud papa, plans to brew up more. Recently KS has earned attention for its flagship Red Trolley Ale, a heavily malted, copper colored, toffee flavored, hearty but drinkable ale. Red Trolley, which began as a holiday beer back in 1989, this year pulled off a brewer’s Olympics dream, taking back-to-back gold medals at the World Beer Cup in Chicago and the GABF in Denver. Not a bad year. Although Paul wouldn’t dream of tweaking the Red Trolley recipe, which relies on oodles of Willamette hops for its aroma, he’s constantly tweaking the panoply of new styles KS has been introducing to its San Diego faithful the past few years. “We’ll continue to push the envelope, including more oak aged beers and more sour beers,” promises Paul, whose learned to thrive on little sleep. In 2009, KS ranked 40th among crafties in terms of volumes, an 11% uptick from 2008 that coincides with KS’ bold mission to take on more styles. Not bad, especially when you consider KS had not aggressively marketed their brews outside of San Diego County. When it comes to hops, Paul continues to follow his nose. He happened upon Nelson Sauvin hops a few years ago and was so impressed several of his brews feature the aromatic New Zealand hop. He’s also fired up to try Crystal, Chinook and Liberty hops from Oregon’s Willamette Valley. In fact, the wheels are in motion for collaboration with a Portland, Oregon brewer on a brew that features 100% Oregon grown ingredients. Little did I know four years ago when I gazed upon that ruddy-cheeked beer buddha that one day I’d be privileged to aid and abet his pursuit of enlightened beers. Today, a few pounds of Cascades for your Rye IPA. Tomorrow, the whole hop and caboodle. We are poised to feed the beast. Will Mad River's Whole Cone-centric Method to Aroma Madness Allow for Properly Designed Pellets? IH Mock-Examines Brewer Dylan Schatz. 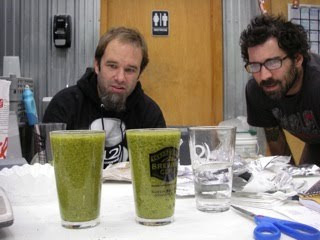 Mad River Brewery in Humboldt County is on our radar. They're craft pioneers. They make great beer. They win medals. They're a touch wacky. And they've hitched their aroma wagon to the whole cone. In short, Mad River offers up the sort of challenge that Indie Hops was born for. Any merchant can sell pellets to a brewer who's already sold on their virtues. But it takes a hop messiah to liberate the whole cone disciple from the chains of nostalgia, romance and tradition. Good Lord that sounds arrogant. The hop hubris! Have I gone too far? My conscience is starting to sting. But wait, we do sell whole cones, too. We just think that pellets, done right, can deliver unto beer more bang for the buck. Like Deschutes and nearby Sierra Nevada, Mad River knows a few things about hops. They're sort of a micro version of Sierra Nevada. Indeed, they brew on the original 17 barrel system that launched Ken Grossman to greatness. Like SN, their operational mantras are recycle, re-use and reduce waste. 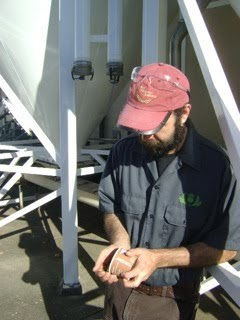 Unlike SN, which uses whole cones only, Mad River does use pellets for bittering. Ripe for conversion? Not exactly. 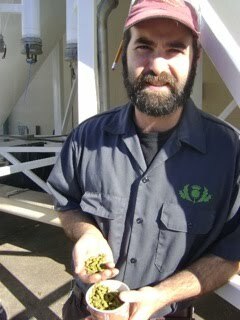 But, to his credit, head brewer Dylan Schatz has an open mind about what whole cones can and cannot deliver. I recently spoke to Dylan after his triumphant return from the GABF in Denver. Mad River had just won the Small Brewery of the Year and three medals, including the Gold for his John Barleycorn Barleywine (which also took Gold in 2007). A little background here. 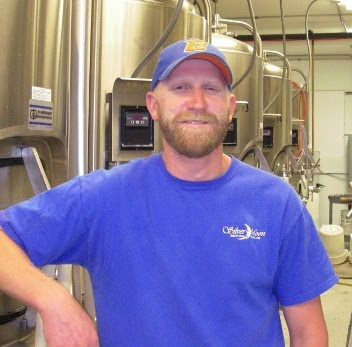 Dylan's been cooking up winning brews at Mad River since 2000. The brewery was established in 1989. 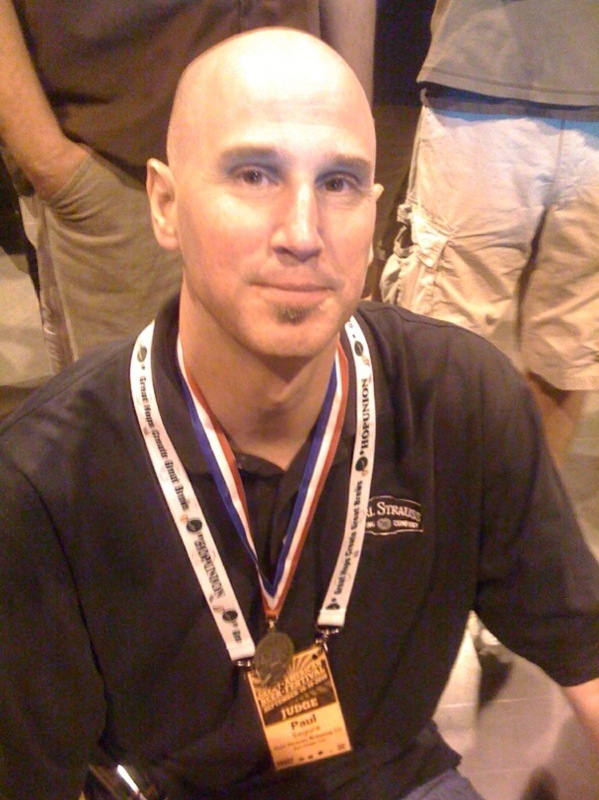 Their flagship beer, Steelhead Extra Pale ale, took the Silver at the GABF this year, after winning the Gold in 2008. Mad River offers 12 styles (6 year-rounds, 4 seasonals and 2 draught only), has accounts in 30 states, and projects 11,500 barrels in 2010, up about 500 barrels from last year. They're growth curve is steadily upwards to the right. Clearly, their eye is on the prize. For aroma hops, Dylan prefers Cascade, US Tettnanger, Willamette, and Amarillo. Mad River pushes the wort through a hop back before whirlpooling. They also dry hop with whole cones in a nylon bag. Their system is designed for the most part to use whole cones. And yet , as the conversation progressed, a question inside me began to burn and burn hotter. With at least trying not to sound argumentative, or arrogant, and prefacing the question with a disclosure that 20 years of trial lawyering have given me habits that are hard to break, I queried Dylan whether he had any ... Dear God ... evidence, empirical or anecdotal, that using whole cones was a better way to extract oils than pellets. "Evidence? Like you mean courtroom evidence," Dylan asked, puzzled. "No, none of that. We just have a personal preference for whole leaf hops. Plus our beers are unfiltered, which means we don't want to clog our whirlpool and tanks with hop pellet sediment. " No lawyer, even a recovering lawyer, is worth his wingtips if can't cook up at least one river-parting rebuttal. “Sir, are you saying that the method to Mad River’s madness, and by that mean I mean your steadfast reliance on whole cones for aroma, is based moreso on tradition, romance and nostalgia than the guiding light of science and reason? “Ah, the glory of efficiency. You’re saying pellets, properly designed, offer advantages in efficiency. Let me ask you, have you ever broken up a whole cone after dry hopping with same? Stay tuned. And Mad River, be glad, stay Mad, but stand by to tweek your tried and true methods if, and this is IH being bold again, the research backs up our intuition. Hey, you gotta believe. BEND, OR. Tyler West is the son of a pipefitter who spent his youth in Boise, Idaho tearing apart and rebuilding engines. The self-described “gearhead” and master brewer at Silver Moon, in Bend, Oregon is an inveterate “tinkerer” who never met a mousetrap he didn’t want to make better. Fewer ingredients? Does this mean Tyler’s lofty brew muse in fact wears a green shade and hand cranks an adding machine, fastidiously trying to stretch every penny? Well, sort of. 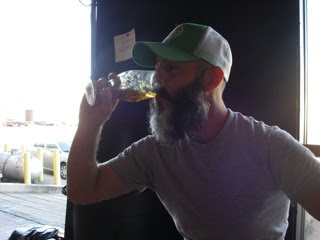 Tyler’s imagination is second to none – witness his award winning Snake Bite Porter and Hounds Tooth Amber – plus his rotating line-up of all star session and experimentals. But, as owner Tyler Reichert will attest, brewer Tyler is a student of efficiency. That is, his up-tempo brewer’s brain is wired to figuring out ways to get the best of both worlds: more flavor, fewer hops, which equals higher margins. What small brewer, especially in this down economy, doesn’t think this way (Answer: the ones in bankruptcy!). 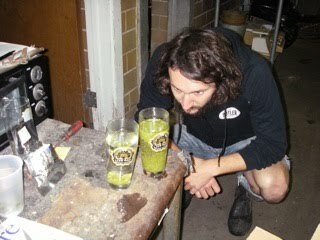 In the age of ever-expanding hop bombs, Tyler’s one of the few brewers not willing to take the bait. He’s dead set on finding ways to do more with less. For example, he’s helped design a hopback system that steeps the wort through a compressed bed of whole hops and recirculates the enriched wort back into the kettle for whirlpooling. The idea of course is to maximize the extraction of oils. 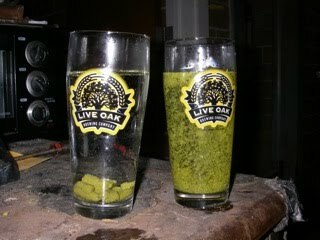 Why push the wort over and through a hop cone just once? Won’t that leave valuable aromatic oils untouched or underutilized? What caffeine junky among us after filling his espresso cup doesn’t spritz his coffee puck with one last burst to drain out the last drop of concentrated goodness? Right now Silver Moon’s mix of hops is 90% whole cone, 10% pellets. 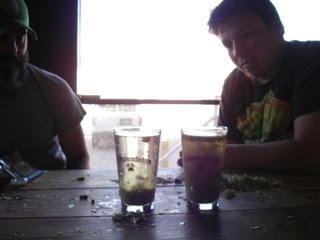 They use the pellets for dry hopping but after examining our pellets, the wheels in Tyler’s head began to spin. The questions came fast and furious. We’d like to check that out. Granted, we’re always glad to see crafties using more hops, but we’re no fans of waste or slavish devotion to pointless protocols. Silver Moon recently purchased a few boxes of Centennial and Cascades, so stay tuned on that interesting project. Tyler’s creativity doesn’t stop where the stainless steel ends. He’s also thinking about ways to release more aromatic oils in the beer after fermentation, during dry hopping. Curiously, he’s been freezing his pellets the night before pouring them into his tanks (either 2 inch or 4 inch PRV). Freeze Dried Hopping? Hmmm. Tyler says this is a trick he learned from another brewer the goal of which is to foster both the dispersion of the hop particles and the oil extraction. Tyler’s theory, if I have it right, is that at 65-68 degrees F the myrcene in the pellets reacts with the CO2 in the beer to essentially unleash the magic. Far be it for this non-brewer to cast doubts, but yet questions linger. The textbooks are fairly clear that heat accelerates the liberation of those citrusy oxidized myrcene gems like Citral, Nerol and Limonene, as well as those heavenly floral Linalool and Geraniol compounds. Heat, at the moment of truth, is a good thing, at least if you want those delightful myrcene metabolies. What if you don't? Perhaps the method to Tyler's madness is to avoid heat induced oxidation, in an attempt to pull the unoxodized bulwark oils like myrcene and farnesene through without any serious changes. Enough there to make my lunken head spin. I better ask around. The focus on the temperature of hop storage is of course energy well spent. We know that the rate at which the alpha acids in certain varieties deteriorates is a function of the storage temperature, the passage of time and the quality of packaging (impermeable barrier, inert low-oxygen vaccum sealed environment). In short, before brewing, cold is good, frozen is even gooder. 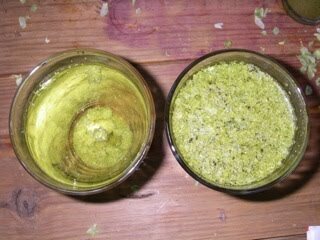 Keeping the hops frozen is a good idea for alpha and oil retention, but at least for oil extraction my intuition, such as it is, tells me that heating the hops up a bit would probably help release more than less oil. For example, I’d be keen to learn the extent to which instead of simply dropping the dry pellets into the tank converting the pellets to a room temperature slurry might enhance oil extraction. 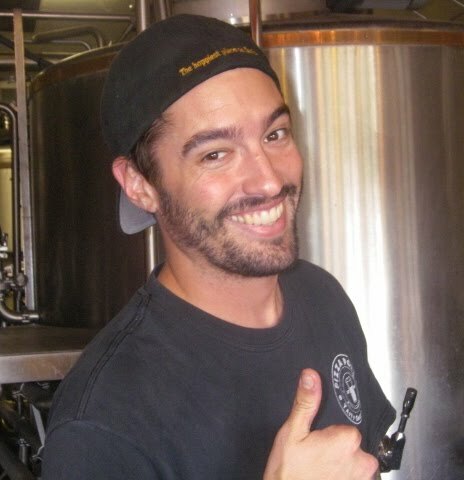 Tyler summed it up best when he confided that like a lot of hard-working, time-pressed brewers he wants to be educated. “I’ve spent a lot of the last eight years trying to master fermentation and cleanliness issues, as well as build up my nose and palate. My plate’s been full. I’d like to learn more about how best to utilize oils,” said Tyler, who gave credit to Indie Hops for sponsoring oil extraction research at Oregon State. Good luck with your IH pellet vs whole cone showdown. May the oiliest medium win! SAN DIEGO. 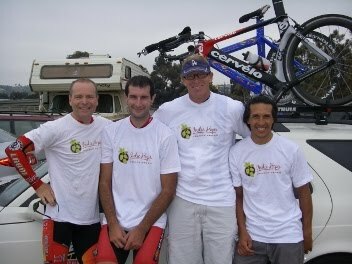 Fueled by bitterness, Indie Hops stayed low, tight and fast to win the Fiesta Island Team Time Trial on September 11th, scorching the 40k island course in 49:57. The rag tag team of beer lovers included Jason "Quadzilla" Bausch, Kenny "The Gambler" Rogers, T.S. Fuggov and Max Kash Agro (aka, Roger Worthington). "We hydrated the night before on a robust menu of the local San Diego Imperial IPAs," recounted MKA, soberly. 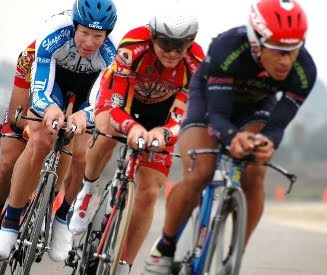 "The race started at sunrise, so we carefully titrated the blood-alcohol to return to baseline just as the gun went off. About half-way through, with the pace hovering at 30 mph, I admit to struggling. But the prospect of pouring down a Sierra Nevada Torpedo IPA at the finish line helped me block out the pain." Indie Hops is pleased with the win. "At Indie Hops, we want to show that a heavily hopped craft brew is an essential ingredient in any serious athlete's training table," said Coach Jim Solberg. "Play hard, drink smart. Can't think of a better way to replenish your nutrients and relieve the soreness after a tough workout than nursing a big hopped brew. Plus you can't beat the buzz." Swamis and Aqua 2 filled out the podium in 2nd and 3rd, respectively (50.10 and 50.11). 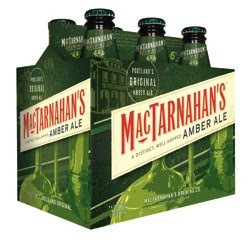 A unnamed but dejected Swami's rider was heard lamenting after the race: "I thought we were supposed to drink that Ultra lite beer that Lance endorses. Next time, I'm prepping with beer that tastes more like beer." Tonya Cornett has won just about every award but you wouldn’t know it from talking to her. She’s not one to boast. But taste her beers and it’s clear why the halls of Bend Brewing Company are adorned with tons of her medals, mostly gold. I dropped by to pick Tonya’s brain about hops, naturally. 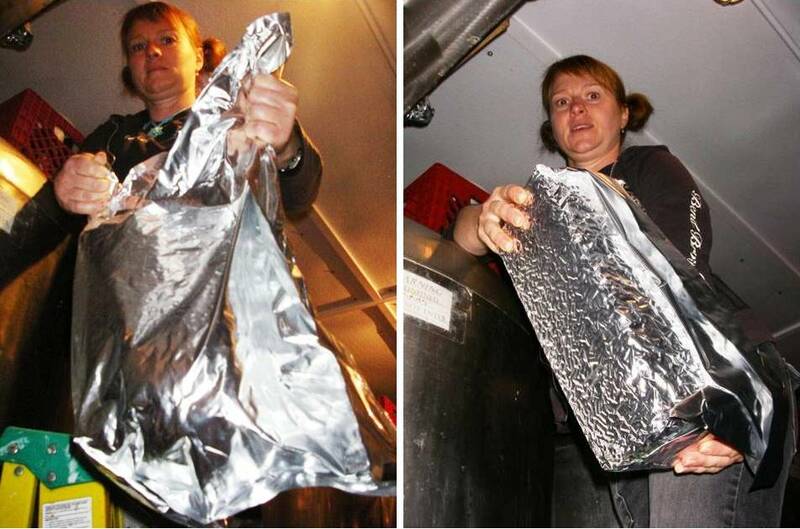 Where most brewers tend toward the crustier side, Tonya is a breath of fresh air. Cheerful, buoyant and smooth. As she said, she doesn’t wear her beers on her sleeves, daring you to knock them off. She wants your criticism, as she’s always looking for ways to improve even those bellwether beers that have won her so many accolades, beers like Outback X and her big bold Hophead Imperial IPA. Tonya’s been brewing up fabulous beers for over 8 years at BBC and 15 years in all. She mainly works alone in a tight brewhouse that’s best compared to the engine room of a vintage WWII US attack sub. A web of hoses like the roots of a giant Doug Fir treacherously line the floors. The rest is stainless tanks, kettles, handles, valves and a cold room. The diminutive but not tiny -- I won’t use the word ‘swarthy’ to describe our chipper, ginger-haired, bob-tailed brewer -- is like one of those resilient five star chefs who manages to churn out the most mouth-watering delights from the humblest of kitchens. The eminently likeable Tonya has a reputation for exceeding expectations, except her own. "I don’t think I’m ever completely satisfied. I’ve learned that brewing is an evolutionary process. You set a goal and patiently take baby steps towards it. When you’re close, that’s when you need to stop and re-evaluate, asking yourself: how can I make this even better?" To improve, Tonya is a big fan of experimentation. 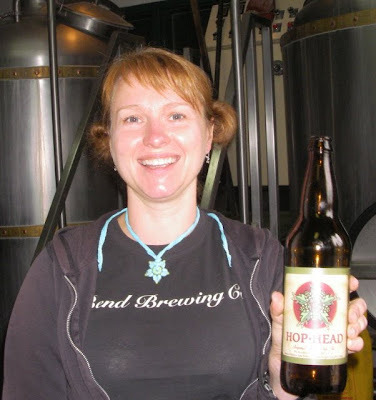 She was the first brewer in the beer hotbed that is Bend, Oregon to use pellets for dry hopping, several years ago. “They thought I was crazy, but now it’s fairly well accepted, except at Deschutes of course where they use whole cones.” I got the impression she was far more proud of that “first” than being the first female to ever win the small brewpub brewmaster of the year award at the World Beer Cup in 2008. Everyone’s impressed with a pioneer it seems, except the pioneer. As far as hops go, Tonya admits to obsessing on the details of getting the aromas and flavor just right. “It’s funny,” she laughed. “Customers really have no idea how much thought goes into getting that aroma just right.” At the same time, she’s an alpha monster who loves bittering workhorses like Galena, Nugget, Northern Brewer and Perle. The funny thing about meticulous, uncompromising craft brewers like Tonya – and this is where I go off script and wing it -- is that when it comes to ordering hops, and accepting them, they often sound powerless. Tonya, like so many otherwise stalwart brewers, has never ever rejected hops , even ones that were intolerably cheesy. If the alpha acid was below the custom, she still took and paid for the hops and simply made adjustments on the fly. Like her brethren, she’s often worried about the shape and hardness of her pellets. “Sometimes they come in baked and shiny. Brittle. They just cleave apart, and it makes me wonder how they behave in the tanks during dryhopping.” She, like others, worries about these things, but like a seasoned trauma doctor in the ER, she’s learned to triage the urgent from the merely important. 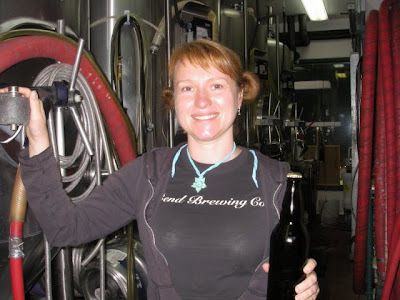 Asked why she didn’t’ hold suppliers to her own standards of excellence, Tonya matter of factly admitted what I’ve gleaned from so many smaller craft brewers: "I have so much going on, so many batches and ingredients that keep me on my toes. I really don’t have the time and manpower to send the hop pellets back, though I should. I feel stuck with what I got. I certainly wouldn’t try to sell them to my friends – that’d be a good way to make enemies." And this is the rub of it. Brewers like Tonya have high standards but because of limited resources they have to make do with the cards they’ve been dealt. They want to learn more about where their hops were grown and why terroir is important. They want to know for each batch the hop chemistry, including oil content and composition. They want to know why a pellet is designed the way it is, and they want to know if there’s a relationship between that design and the oil extraction and dispersability. They want to know how to optimize oil utilization. In short, they want to be educated. And that’s where a hop merchant comes in. Take a look at packaging, for example. How many brewers today specify that they want their pellets packaged in a soft or hard pack? How many know what the optimal residual oxygen content should be? Brewers certainly would like to refrain from having to break up cementious bricks of pellets with a hammer and chisel, but how does a brewer know that the pellets in a soft pack are preserved correctly? Can a soft pack of pellets (think bag of potato chips) still be relatively oxygen free? How does one know? What’s the standard? And why? Tonya expressed both puzzlement and frustration over these packaging questions. She recently received four (4) 11 pound bags of Cascades from a supplier [see the pictures above]. Two were hard as a brick. The other two were loose, as if the bag had been punctured. Were they punctured? No hole was visible. The supplier simply sent the bags with no explanation, no attempt to educate. "I guess you sometimes fall into the ‘small brewer mentality’, where you just take what you get and forget that you have a choice," confessed Tonya earnestly. "Believe me, I’d like to have the data. I’d like to hold them [the hop merchant] to a standard, like a warranty, but we’re not Deschutes. Show me a merchant who provides me with the data and tells me why it’s important and I’ll vote with my dollars." Heard that. Just as we are committed to protecting our pellets from excessive heat, we also want to insure that our pellets are packaged in an inert environment in such a way that facilitates ease of use. Stay tuned for further news on the packaging and pellet design fronts. In addition, with the help of our friends at Oregon State, we’re looking at developing a science-based hop substitution chart. The effort is to provide as much valid information to the brewer and let them decide. When it comes to enhancing hop flavor, packaging is a critical issue from start to finish, from the hopyard to the brewhouse. 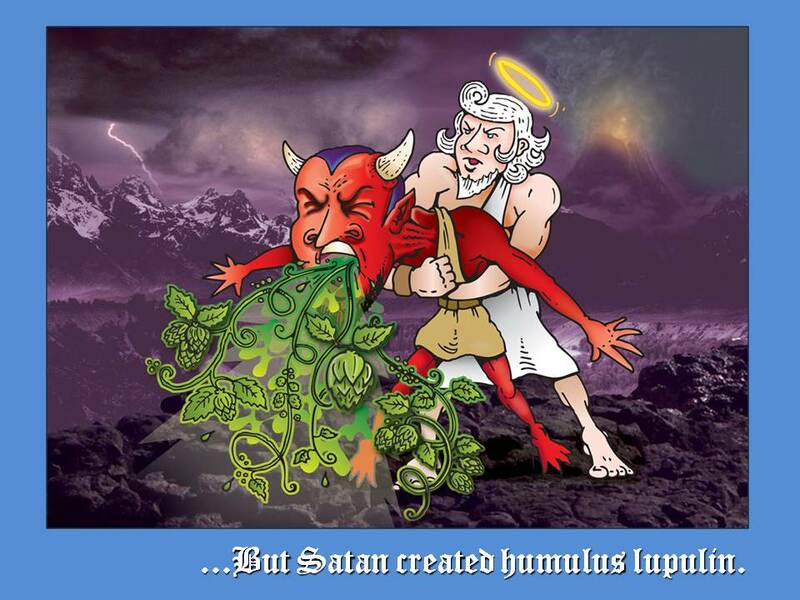 Nature designed the hop flower to protect the snugly tucked lupulin glands. IH is designing pellets to protect and enhance those aromatic oils. Brewers understand the need to protect the hop metabolites in their beer by using darker glass t bottle. The emphasis on hop oil protection carries all the way to the bar where the brew is served. 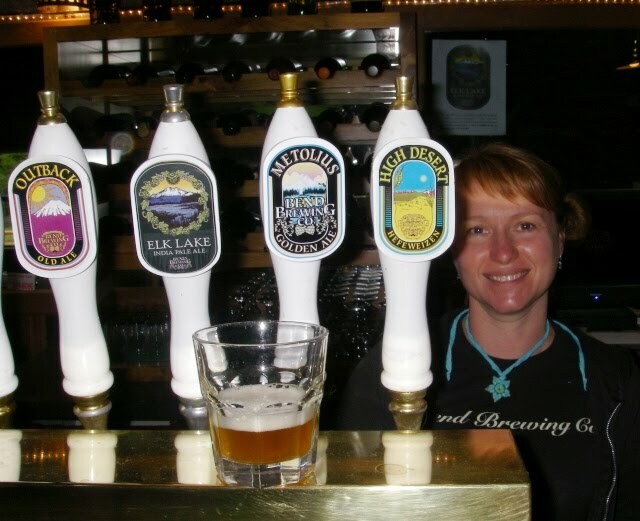 As Tonya stressed as we sat down at the bar to sample her work, while the bartender happily pulled a draught into a warm wide mouthed glass, “I can’t stand it when I see a hoppy IPA poured into an ice cold pint glass. You have to let the oils in these beers breathe.” You have to wait until the time is right. Until then, we’ll be striving to protect those magic oils from the ravages of oxygen, heat and all manner of slap-dashery. PS Thanks for using our Centennials in your Elk Lake and good luck at the Alpha King Challenge. Readers: check out Tonya’s unlabeled scarlett IPA (9% ABV, 80 IBU, Centennial and Chinook), to my tastes, a podium contender at the upcoming World Beer Cup. As previously reported, Indie Hops has contracted with Goschie Farms to grow 20 acres of USDA certified organic hop. I recently visited the fields and my goodness did they look healthy, clean and orderly. See the pictures below. We planted both Cascades and Centennials. Here’s a thumbnail sketch of the history of these historic hops. This is the biggest single tract of USDA certified 0rganic hops in Oregon hop history. Per Gayle: the rhizomes were planted in an organic compost mix in February and the pots were then placed on a graveled area. With the cooler and wetter than normal Spring, the pots onthe warm gravel did quite well in establishing themselves. It wasn’t long before they developed pretty white/bright feeder roots. I’m glad we planted when we did. Had the rhizomes been placed in the ground in March/April, they would have sat shivering. We waited, thank goodness. Once the grass cover crop was worked down (grass tuffs are slow in breaking down), the pots were planted in early June. That process took a little longer than planned with the ground never drying out enough to work it without causing compaction problems, which is a fancy way of saying we would’ve got our tractor stuck in the mud. In June, we planted into the warm ground with the now composting cover crop. The plants have been given a great start. The ground will not be certified organic until 2012 (3 year transition from conventional), but he plants will be grown under organic specifications during the transitional period. From past experience, this will give the plants a great start with this extended establishment period. In other news, while down at GF, I spied signs of Dr. Shaun Townsends handiwork. As you know, Indie Hops has financed an aroma hop breeding program at OSU. The program has been designed to foster collaboration between academic breeders, local hop farmers and brewers. Below are a few pictures of hop vines festooned with brown bags, the insides of which contain freshly pollinated female cones. As Shaun reports, the bags above are part of the crosses that he made in July of 2010. For each sidearm, he clipped the major leaves off, secured a bag over that sidearm, and introduce pollen from the desired male parent to complete the cross. The plants and bags will stay in place until about October 1, 2010. At that time, Shaun will take the plants down and haul the crosses back to OSU for threshing, seed-cleaning, and pre-treatment for planting. In addition to Goschie Farms in Silverton, Dr. Townsend is also pollinating female cones at Coleman Farms, our other farm partner (the Alluvial Farm near Independence, Oregon). The progeny from the various crosses should produce a wide range of genetic types for selection. One of the main criteria in selecting pollen and seeds for crossing, in addition to a muscular oil profile, has been downy mildew resistance. PS That well dressed man in the hopfields reaching for a cone on the "bag vine" is our good friend and gentleman brewer, Dan Kopman of Shlafly from St. Louis. Harvest Time! Weird Scenes Inside the Green Gold Mine. Hoppy Readers: Please join me on a quick tour of Goschie Farms during the hop harvest in late August, 2010. Whole lotta shaking going on! From the back of the truck workers fasten the hop heavy bines to a conveyor and then sent through a gauntlet of thrashers which strip the cones from the bines, sidearms and stems. The action, sights and sounds are both deafening and invigorating. More twists, turns, drops, jolts and jumps than the corkscrew coaster at Six Flags. Matt Sage, above, embracing Gayle’s Green Bounty. Normally Matt’s going 100mph with his hair on fire. I’ve never seen him this cool and collected. Must be the opium in those Willamette hops. From the picking room, the hops are conveyored over to the kiln and drying rooms. Here the green gold falls from the belt like fruit from a tree onto the drying room floors. Goschie Farms has six hot air blowers which heat the raw cones up to about 140 degrees F just long enough to leave about 10% of the cone’s original moisture. Check out the sea of green above. The drying room is in a coverted barn that’s been the heart and soul of Goschie Farms for decades. The picture doesn’t show it, but the room is very, very humid. Poke your head in there and your glasses instantly fog up. Handcrafted hops. We like to talk about our hops are grown with Tender Loving Care and processed with attention to quality over quantity. Here’s a worker who meticulously culls from the hop piles before drying any and all leafs, branches or other debris. A labor of love. Again, here’s the normally peripatetic but now fully sedated Matt in full hop zen mode. “If you find yourself floating in a sea of green, close your eyes , relax your shoulders, and let your mind open up. You can hear the hops chanting: brew me, brew me, brew me,” says Matt. Glory be to Gayle in all her hop glory. Gayle Goschie, second from left, flanked by intrepid hop travelers, from left to right, Dan Kopman (Schlafly), Yours Soberly, and that ball of fire, Matt Sage, at the base of Mount Willamette. Fruits of Labor. Here’s the end result: densely packed 200 lb bales of hops. Bales are then trucked about 3 miles down a flower strewn farm road to Indie Hops clean, green pellet mill, where Captain Jim Solberg awaits in the catbird of his forklift, ready to offload the bounty into our cooler, where the oily cones are frozen down to 26F. A few days later they’re converted into big fat oily pellets before being packaged in oxygen purged foils and sent right back into the cooler awaiting delivery to your kettle. When I provided the background information regarding the hop composite CTZ I did not have any intention to malign the lasting memory of my friend Chuck Zimmermann. I have always counted Chuck as my friend and we have had a number of cooperative activities over the years. In writing the article about CTZ hops I simply wanted to put facts together that many insiders, especially the older ones, already knew. Columbus and Tomahawk are identical and this has been publicly acknowledged. Zeus, according to unpublished genetic marker analyses done by USDA scientists at Oregon State University, is very similar, if not identical to Columbus/Tomahawk. Thus, the designation CTZ which is sometimes used in trade reports. I am sorry to receive feedback from a few readers who perceived my historical account as attempting to cast Chuck Zimmermann’s contributions to the hop industry in a negative light. Far from it. Chuck has made tremendous contributions to the US hop industry. He has initially guided my entry into the field of hop research and I am very grateful for the valuable clues that I got from being associated with Chuck over the years. When Chuck resigned from his USDA position he was concerned that valuable USDA hop material might be lost until a successor for his position could be found. And therefore, he moved some of this material to a private location for safe keeping. That likely also included some breeding material from Chuck’s research efforts while working for USDA at WSU Prosser. I simply wanted to point out that even today we do not know anything about the pedigree of CTZ. The Columbus patent (US patent Nr. 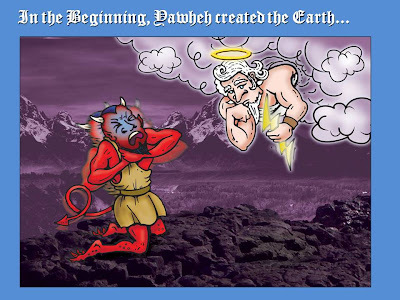 Plant 10,956, filed March 22, 1995 and issued June 15, 1999) states that “Columbus was bred as the result of an open-pollination cross that was carried out in 1982 ….” Thus, the male parent was unknown, as indicated by the word “open pollination” . Seed, however, was collected on a female plant which has never been publicly identified and is not identified in the patent. I am sorry to see that my interview with Indie Hops has unintentionally given a negative impression to some readers and I would like to apologize for that. The most widely grown private hop variety, or shall I say varieties -- "CTZ" (Columbia, Tomahawk and Zeus), which industry insiders believe are actually one and the same, and the trade often designates as CTZ, were developed by Charles E. (Chuck) Zimmermann, formerly a USDA hop research scientist stationed in Prosser, Washington. When Zimmermann resigned his position in about 1979, there was nobody to run the USDA/Prosser hop program. The primary repository for hop germplasm is located at the USDA Hop Program in Corvallis, Oregon, but the USDA kept a back-up collection in Prosser. Because of this purported fear, Zimmermann moved a large part of what he considered the “most valuable breeding material” to his personal location, where of course only he had access. 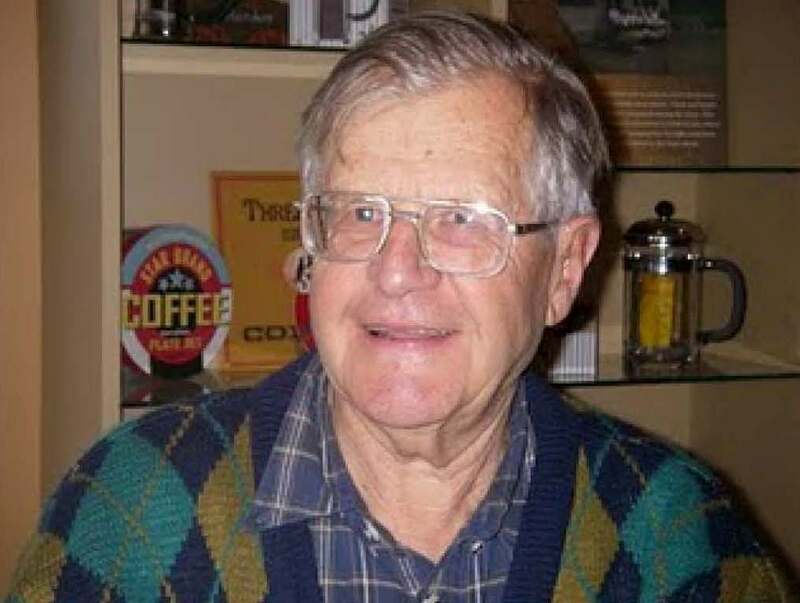 After 1979, Zimmermann quit the USDA and entered the private sector as a hop breeder. From Zimmermann’s collection, some of the USDA breeding material found its way to a commercial location. USDA hop germplasm made its way to Humulus Hop Trade Corp, owned by Segal Hop Co., and later to Hop Union, where Zimmermann continued his private breeding efforts. I’m fairly certain that his private efforts involved the use of USDA hop germplasm which had not been publically released. I don’t have any knowledge that Chuck sought permission to use the USDA generated germplasm. Was it “borrowed”? Perhaps, but I don’t know for sure. Zimmermann and I always remained friendly. But I asked Chuck repeatedly, when the topic of patenting Columbus and / or Tomahawk came up, to tell me the pedigree of this “new” hop. He always refused to tell me, which I thought was odd, since as USDA Hop Scientists we had a history of collaborating and sharing. Patenting did not become the rage until the laws were changed in the mid-1980s which made it easier to obtain a patent on a plant. Prior to that, before there was any serious thought about patenting, Zimmermann had already left Hop Union to join another hop trading company. Zimmermann’s successor at Hop Union (Dr. Greg Lewis), to my knowledge, led the charge to apply for a patent for the hop now known as Columbus. Zimmermann, who had done substantial work on Columbus as a USDA scientist and then later for Hop Union, but who was now working for a competitor, objected. On one occasion, Dr. Lewis phoned me about their high-alpha hop strain [Columbus] that he inherited from Zimmermann. He was excited that this hop had superior yield potential and good alpha values, but its storage stability was a bit weak. He told me he wanted to patent it. Since I had already released a public hop aroma variety called “Columbia” (the half-sister of Willamette), he wanted to know whether I objected to Hop Union naming the new super-alpha hop Columbus. I told him I did not object. He predicted it would be a very valuable and popular high alpha variety. Of course he was right about that. I asked Dr. Lewis about the pedigree of Columbus. He refused to give it to me, just as Zimmermann did. Perhaps he did not even know it himself. I always found this disturbing. I worked for the people. I wasn’t a threat to his company’s lock on the variety. It drove home to me how the times were changing. What I did for the public, they wanted to do for themselves. What I tried to do for all hop farmers, they wanted to restrict to just a select few who were tied in to the merchant. And it’s always struck me as dangerous when a private breeder can get access to USDA germplasm before it’s been released to the public. That smacks of an insider job. When the “new” super-alpha hop Zeus came along a few years later, propagated by S,S. Steiner Inc., I again asked about the pedigree. No information was provided, except that I was told it was similar to Columbus but with “even higher yield potential.” It is now widely believed that Zeus is very similar if not identical to Columbus/Tomahawk, the latter two having been publicly acknowledged as being identical. When Zimmermann's health started to decline (Alzheimers, Parkinsons) I asked Ralph Olson, who originally had also worked at Hop Union, to contact Zimmermann about the Columbus/Tomahawk pedigree. He never got it or if he did, he never told me about it. Hop Union was later bought out by Haas-Barth Inc, and Olson purchased the hop package trade (a Hop Union subsidiary) which Haas-Barth at the time had no interest in.. Sadly, Zimmermann passed away over a year ago and took the pedigree knowledge with him to his grave. We have a pretty good idea of the genetic background of CTZ. 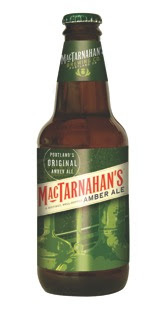 It most likely came from a USDA hop germplasm line that had Brewer's Gold as one of its main components. Most likely it was not just Brewer's Gold, but one of the breeding lines that I had sent to Prosser for evaluation under local conditions while Zimmermann was still working there. I sent it up there for evaluation, not so it could be taken by a private breeder for use in obtaining a patent. Sharing is supposed to be a two-way street. Everything changed when the patent laws made it easier for private breeders to corner the market on a new variety, even though the ‘new’ variety likely was built on a foundation of USDA created germplasm, in this case, germplasm which hadn’t even been publicly released. Those who know me understand that I tend to fixate. I get the sandy grain of an idea, apply loads of constant pressure (with maximum compression around 3 in the morning.) and either a blood vessel bursts or out pops a pearl. Here’s my latest pearl in process: the need for public-private hop breeding partnerships. Here’s what started the itch. I was perusing the Strategic Plan of the Hop Research Council (1998, updated in 2007). By way of background, the HRC consists of a few larger brewers and all the usual merchants in Yakima. These are the insiders who have a tremendous influence on the direction of how public research dollars are spent. They also assess themselves certain fees and make additional money from HRC available through research grants. Now, everybody knows that I think the world of Dr. Al Haunold, an extraordinary public servant I’ve heralded on this blog as “the People’s Hopmeister.” After escaping the Nazi War Machine and emigrating to the US, eventually my Austria-born mentor came to work at the USDA in Corvallis where from 1965 to 1996 he took the lead in releasing to the public over 20 new hop varieties. Twenty! For Free! Al didn’t patent those inventions. He never saw a dime from any royalties because there were no royalties – not then, not now. Neither did Uncle Sam, nor anyone else on Al’s team of public breeders. Anybody can get access to rhizomes for hall-of-fame US varieties like Cascades, Willamette, Nugget, Liberty, and others – all the hopwork of our Nation’s No. 1 Hopmeister. Anyone can get ‘em, and anybody can grow ‘em. Al retired in the late 1990s but his final collaborations were not released until the early 2000s, to wit: Newport and Mt. Rainier (both crosses made by Al in 1994), Horizon (cross made by Al in 1970), and the low-alpha Teamaker. By the way, Teamaker’s roots go all the way back to 1970. 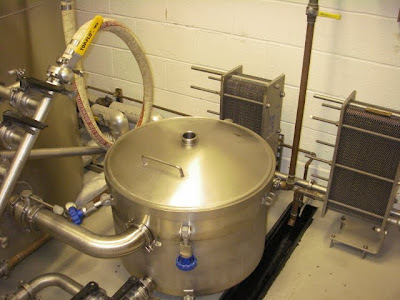 The brewers were not keen on it because it contained virtually no alpha acids. But his technicians loved it for brewing hop tea. Since then – the early 2000s -- not a single variety has been released. What happened? Did the USDA lose its edge? Did they surrender? Or did they just in fine George W. Bush fashion hand over the keys to the candy store to private industry? To answer that, let’s go back to that HRC “strategy” statement that has so jarred me – a statement which in truth prompted me to get into the game and to sponsor an aroma hop breeding program at Oregon State University. Here it is, verbatim, from the HRC strategic plan (click here to read the entire text). "While varietal development is a critical requirement for the continued success of USA hop growers, there is some concern that public breeding programs should not be involved in the development and release of varieties." Huh? What’s so egregious about public servants serving the public? Who voiced this "concern"? Private breeders who saw an opportunity to fatten up with their snoots in the public’s trough? I asked Al whether there was any fuss about him taking his work too seriously, that is, depriving private breeders of their chance to make a buck on the public’s dime. Al shrugged off the strange insinuation. "No, I wasn’t aware of any concerns. We didn’t start seeing any private breeders in the US until the mid 1980s when the laws for patenting agricultural products became more lenient. Before then, I actively worked with brewers, farmers and merchants, and we all got alone fine." With stellar results. "Several private breeding programs actively work towards developing and releasing public and proprietary varieties grown with the support of a marketing system that helps growers sell their product on the world market." (Italics added). Private breeders release “public” varieties? Well, that’s a new one. Al just had to laugh. “That’s an oxymoron. A private company can’t make a public release. I don’t know what they’re talking about.” Aside from this nonsense, the meaning is clear: the merchant-big grower-breeder industrial complex has set its sights on controlling the world market. That hop hegemony begins with patenting varieties and granting licenses to selected growers. An excellent strategy for controlling the price and supply of US hops. Whoa doggies! First, the phony argument that “everybody’s doing it.” Second, no attempt to proffer evidence that the public is hurt by an aggressive, efficient and amazingly productive public breeding program. Third, the cavalier way in which the privatizers skip over any ethical issues and swinishly assert that the fruits of the public’s labors is their god-given birthright. The privatization model kicked in about the time Al retired (nice send off, boys!). How many aroma varieties have sprouted since then? 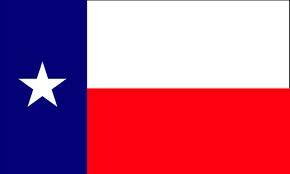 Amarillo? Well, that’s an aroma, but it wasn’t the result of a private breeding program—the Gamaches found it on their farms and trademarked it, which means only they or their chosen few can grow it. Ahtanum? It’s relatively recent, but we don’t know much about its parentage. Citra is a recent privately developed hop, and by all accounts it’s a home run. But we don’t know much about where the germplasm came from. Was publicly owned germplasm exploited? If so, did the patent owner agree to share any royalties with the public? And that’s the point. There is absolutely nothing wrong with private breeding. It should be encouraged. It’s risky. It’s expensive. It’s time consuming (8 – 12 years on average). As long as there is robust access to public varieties, the profit margin on any new variety is a matter of speculation. And any breeding mission will necessarily involve brewer feedback, just as Citra did with Sierra Nevada and Deschutes, to name a few. The wicket gets sticky when private breeders utilize public germplasm, develop a “new” variety and then attempt to patent it for their own personal gain without sharing the fruits. Since patent applicants generally insist on keeping secret their formulas, recipes and designs, they jealously guard the pedigree of their plants like the proverbial rich ugly old maid and her silver spoons. That’s one big reason why Indie Hops funded the aroma hops breeding program at OSU. Public hop breeding, especially of aroma varieties, had essentially died not too long after Al retired. Our goal has been to empower OSU to invent, invent, invent. With inventing comes ownership. With ownership comes the right to impose reasonable conditions. With conditions comes the potential for royalties. With royalties comes a predictable revenue stream, a big chunk of which can be re-invested back into a public-private program. The death of public hop breeding programs, we believe, is not only a shame, it’s a punch in the stomach to the work and legacy of The People’s Hopmeister, Al Haunold. Indie Hops stepped in after InBev/AB pulled out to fund a first-ever aroma hops breeding program in large part to continue Al’s pursuit of hops. Does this mean we believe we are entitled to complete ownership of any new hop “invention?” Absolutely not. We believe in sharing. We look forward to executing on a public-private model that exacts sweat, skill, equity and labor from each stakeholder and commensurately rewards them while also serving the hop growing and hop-loving public.